How should I re-enter? Hey Blog, I have returned. Missed you. I do that in my journal but it’s private with only me making fun of me if I’m being silly, trite, maudlin, ignorant and so forth. Blogs aren’t as forgiving. YOU will know if and when I’m any and all those things. The goal is that henceforth—or at least until I’ve returned next September from Big 2015 Trip—I will not miss a day of blogging and it will all be about travel—this series of posts to be called Geography. Good writing, original observations, and an occasional stimulating thought will be the order of the day. With a few photos because…well…we all like photos which is reason enough. But remember not to hold me to these standards today—I’m just back. Today I’m off to Minnesota. Two weeks. Vacation. My big trips are not vacations by any stretch of anyone’s imagination. They are very hard work in fact. And stressful. And exhausting. And expensive. And Brilliant. Sunport: Can’t get on line. Already lost my handy little accessory that lets me plug multiple things into Surfy. Get it together my dear. This is practice for B15T. And the first lesson for today is to take along an extra of anything VERY important. Like money perhaps. My second for today is to spend a lot of close personal time with my new backpack—the large gorgeous fancy burnt orange and lime green one that has a number of vital but slightly mysterious pockets: under, over and to the side of each other. We need to bond. I’m having a small dish of taquitas, which may have been invented for southwestern airports. They are awful little things. Spicy ground mystery meat rolled into a baby corn tortilla and deep fried. The deep-fried part is excellent if I salt it a lot. The stuff inside is a bit nasty but probably not dangerous. And I’m having a pinot grigio. I may have another. The thing is the Minneapolis-St. Paul airport actually has good restaurants and shops so I should save some of my daily indulgence quota for there. The layover on the way to Duluth. Think I’ll wrap this opening blog post of the rest of my daily blogging life up. Ate two of the little taquitas. There are two more. If I had a dog I would not take them home for that dog. So just one more airport observation. A lot of American men look like hell. Big wrinkled t-shirts, big slightly dirty-looking jeans—just hanging there, big bellies, baseball caps—a statement of … ? I’m doing an informal survey—what I’ve just said applies to approximately half of all men at the Albuquerque airport. That’s not okay even by present going-out-in-public standards. At least try for fitting and laundered. Never mind what Anderson Cooper says. You must wash your jeans occasionally. So in all fairness, guess I better look at us—women. I look alright, just so you know. And I’m super comfortable. My informal survey says—we win. Not by much but at least we look showered. Ordered my second pinot grigio. Tonight Grand Rapids, Minnesota. Yeah…ya betcha… The devil made me say that. Now at Ike’s in the Mpls airport. My uncle’s name was Ike. Ilif actually. I’ve ordered a walleye sandwich and a Bloody Mary. I. Am. On. Vacation. 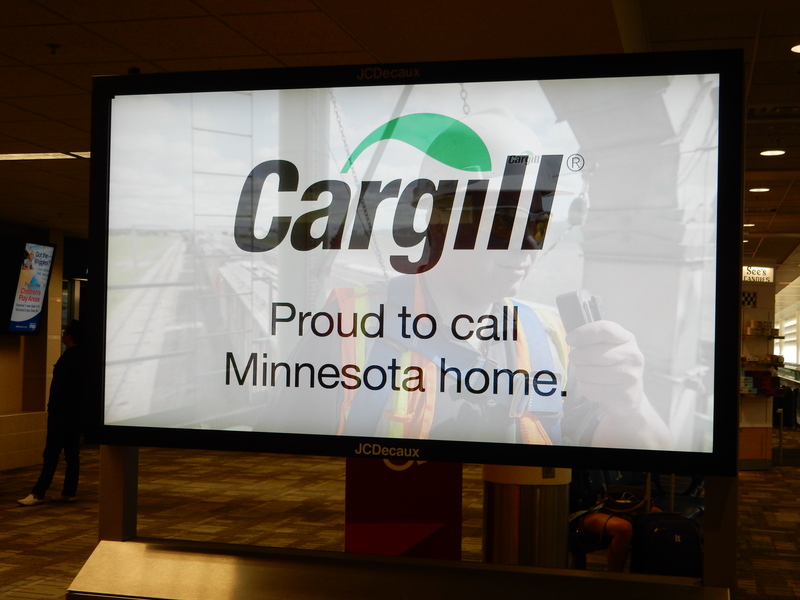 MY FIRST JOB EVER–CARGILL BOARDMARKER. I am so happy to see your travel blog again…I missed it…and you. The traveling public on airplanes almost looks like they are going to Walmart. Taquitas at the Sunport…oh my. I remember the first time I saw the Sunport. I arrived at night after my first airplane flight, the building looked like an adobe church.,..baggage claim was literally on the sidewalk. They brought the bags out and put them on the sidewalk. I arrived in my jacket and tie because that is the way men traveled then. I traveled on TWA and we ate dinner on real china and it was kind of real food, certainly not sandwiches in a paper carton for which you paid extra. Ah progress, isn’t it wonderful.